Perfect geometry makes a perfect ring. For maximum glitter, brilliance, and beauty, geometrical diamond shapes are necessary to take advantage of diamond's unique optical properties. But how does geometry really influence diamond shapes and their appearance? Geometry is the ancient mathematical study of angles, proportions, lengths, areas, and other measurements and how they relate and interact with one another. The anatomy of a diamond is based in geometry, with a rigid tetrahedral crystal structure that gives the gemstone its amazing optical properties of reflection and refraction. Jewelry artisans must thoroughly understand geometry in order to craft diamond cuts with proper angles and proportions, and individuals who understand how proper geometrical diamond shapes influence the appearance and value of a particular stone will be able to choose a superior diamond whether they are interested in a loose diamond or are just choosing a stunning engagement ring design. There are several geometric properties essential to a valuable diamond or gemstone. The stone must be cut with proper proportions between its length, width, and depth or it may inadvertently conceal light or weight. Furthermore, the angles between facets must be meticulously shaped to best reflect light and enhance the stone's clarity and color. A poorly cut stone with bad geometry may appear dull or include shadows, or it may be inappropriately priced based solely on measurements rather than the value of its appearance. The geometry of a diamond shape also influences its durability. A poorly balanced stone may be unable to resist fractures and cracks, though ill-designed geometry can be overcome by clever settings and other ring details. Every diamond shape incorporates different types of geometry, but there are only four basic geometrical shapes that influence the different types of stones. Circle: The circle is obviously the basis for round diamonds, though oval diamonds, pear shapes, and heart shapes also rely heavily on circular geometry for their brilliance. To a lesser extent, cushion cuts and marquise diamond engagement rings also use circular geometry. Square: Because of diamond's natural crystal structure, square geometry is easy to incorporate into a cut stone. Princess cuts, emerald cuts, and radiant cut diamonds all use extensive square geometry, though cushion cut stones and Asscher shaped diamonds also incorporate square features. Triangle: The sharper angles of a triangle are immediately evident in trilliant diamonds, though pear, heart, and marquise shapes also require precise triangular measurements. Octagon: The most complex geometrical diamond shape is the octagon, which is put to vibrant use in Asscher cut engagement rings. The deeply clipped corners must be precisely aligned for an effective Asscher cut, though to a lesser extent radiant diamonds and emerald cuts also incorporate octagonal principles. The precise proportions of these geometrical diamond shapes can vary, though most jewelers recommend the classic ratios that are most familiar to couples shopping for engagement rings. Classic proportions typically maximize the stone's appearance when compared to its carat weight, optimizing the market value of the stone. Round 1.00 Dimensions should match as closely as possible. Princess 1.00-1.05 Length and width should be nearly equal. Emerald 1.30-1.40 Length should be roughly 1/3 greater than width. Asscher 1.00-1.05 Proportions should be as identical as possible. Oval 1.33-1.66 Length varies from 1/3 to 2/3 greater than width. Marquise 1.75-2.25 Length is from 3/4 to more than twice as great as width. Pear 1.45-1.75 Length varies from 1/2 to 3/4 greater than width. Radiant 1.00-1.05 Proportions should match as closely as possible. Cushion 1.00-1.30 Proportions can be identical or the length can be 1/3 greater than the width. Heart 0.90-1.10 Proportions should be nearly equal for the best shape. While traditional proportions are classic and elegant, a couple can actually select uniquely proportioned diamond shapes for a more unusual engagement ring or one that better suits their style preferences. A very narrow band, for example, may be better paired with a narrow, elongated diamond shape which will look elegant and regal on a bride's slender finger. A woman with thicker fingers may want to opt for thicker proportions that are more balanced with her body structure. When choosing a diamond based on geometry, it is also important to consider any side or accent stones. If multiple fancy diamond shapes are used, the proportions of individual stones should be as close as possible for a coordinated match rather than an unbalanced ring. 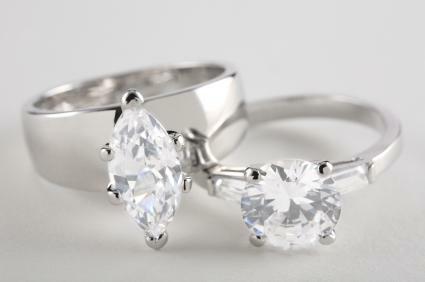 Geometrical diamond shapes must be carefully considered when couples are investigating diamond quality. Well cut, geometric stones will be more brilliant and elegant, maximizing their sparkle and beauty for years to come.